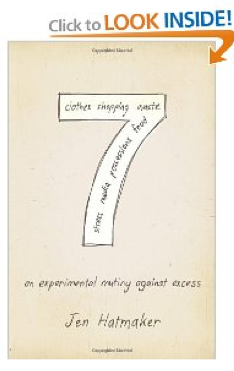 I kept hearing great things about this book called 7: An Experimental Mutiny Against Excess. The title alone was enough to have me intrigued, but the rave reviews convinced me to buy a copy. And I’m so glad I did. Jen Hatmaker is an engaging, funny, and convicting author. I’ve never read anything by her before, but, after reading this book, I want to read Interrupted and Barefoot Church, as soon as I can get my hands on a copy of them! 7: An Experimental Mutiny Against Excess chronicles her seven month seven-things experiment. Each month, she chose a different area to focus on and then pared down the excess in that area. For instance, the first month, her focus was food. So she limited herself to just eating seven different things during that 30-day period. The second month she only wore seven items of clothing for the 30-day period. Try to step back and just think for a minute what it would be like to only eat seven things or only wear seven clothing items for 30 days. For more of us, that seems almost impossible to even imagine. And yet, think how many millions of people around the world would consider it a luxury to have a choice of seven different foods each meal or seven different clothing items. Jen didn’t set out on this experiment just to have great book subject matter; she did this seven month experiment because she wanted to challenge her own long-ingrained entitlement mentality. In this book, she writes candidly about her experiences–victories, failures, and hilarious stories along the way!–in order to challenge others to take a step back and really examine our own hearts when it comes to needs versus wants and what truly matters in life. The book is thought-provoking, for sure, but it’s not guilt-invoking. And it’s well worth the read. Other recent good reads: From Dust and Ashes, Symphony in the Dark, Between a Rock and a Grace Place, and Arms of Deliverance. See all books I’ve read so far in 2012 here. I am in Jeremiah in my 90 day Bible. I finished Grace for the Good Girl by Emily Freeman, loved it so much!! I also worked back through A Place of Quiet Rest by Nancy Leigh DeMoss. I re-read it every so often to keep my devotional life fresh. Currently reading The Resolution for Women by Priscilla Shirer and Instructing a Child’s heart by Tedd Tripp. Kisses from Katie, the story of a girl who went straight to the mutation field out of high school, is a must-read. The two of these back to back should be incredibly life changing! Sounds like a great book to get started thinking in a totally different mindset. I think most of us in America have never really given a thought to how lucky we are and how we so easily take things for granted. I hope my library will have this book soon. Sounds like a must read for any family wanting to reevaluate needs! Thanks for the review! JUST finished this book and totally loved it. Laugh out loud funny and convicting at the same time! I read this book…..currently reading “A hole in the Gospel” and I am enjoying the book tremendously. Jen Hatmaker is one of my favorite authors! Any book by her is absolutely amazing! I haven’t read this one yet, but it is next on my list! This book is from awhile ago, but I’ve always wanted to mention it. It’s called, “Cheap: The High Cost of Discount Culture” by Ellen Shell. It is a thought-provoking book on the different effects of cheap products. I didn’t agree with all of the author’s conclusions, but I did find it helpful in expanding my view of what spending money means. I’m very interested (and pleased) to hear your review of this book. I’ve heard Jen Hatmaker speak in person at a weekend conference and, honestly, I wasn’t in agreement with many of her “social justice” views or some of her hermeneutics. For that reason, I have been unwilling to purchase it. I’m glad to hear you enjoyed it. Maybe now I will reconsider. I am currently reading “A Praying Life” although the author’s name escapes me. It is AMAZING. I come from such a strict and legalistic church background, and I am finding this book freeing in many ways. I read it, and found I disagreed with a lot too, but the point behind the book was good. I did pass it on though when I was done. I loved how she made me think. Even if I wouldn’t necessarily end up at the same conclusions as her, I really appreciated how it caused me to step back and examine my life and the choices I’m making as a consumer. I just finished Coming Apart. Fantastic. Every American should read this. I’m working on On Paradise Drive, which is funny. I just started The Principles of Knitting. I am a very experienced knitter and learning a lot, but this is the book I would recommend for anyone new to knitting who really wants to master the craft. Oh, and I just finished Unnatural Selection which is another one of those books I’m trying to convince everyone I know to read. If anyone wants to read this and has a Kindle, I can lend it to you through my Kindle. I just finished reading this a few days ago. It was really good. Just let me know if you want to read it. I’ll send it to the first person to say so. I think it’s lendable for 14 days so after that someone else could borrow it. I have a kindle on my computer and would love to read this book. Hi Lori. Is having a kindle on your computer just like having a kindle? Do you download books the same way? Just wondering how I’d send it to you. I believe I just need your name and your email address and then I can send it. My email address is aaroncaleb@gmail.com if you want to send me your info I can send it to you. I think you have 3 days to accept the book or else it goes away so just may sure you accept it within 3 days. Hope you enjoy it! I didn’t realize you could lend Kindle books. How does that work? I would like to read this book. Thanks! Hi Sandi. Yes you can lend certain (not all) Kindle books to other kindle owners for 14 days. You can look under Product Detail and if it says “Lending: Enabled” then you can lend it. Some authors do not agree to lending so only certain books can be lent. You can even “borrow” kindle books from most public libraries nowadays. Since Lori replied first, I will send it to her, but when she is done (I think the most you can have it is 14 days) I will send it to you. I just need your name and email address. You can send me a direct email at aaroncaleb@gmail.com. Love that Jen Hatmaker and all of her writings! Crystal, “Interrupted” was fantastic. I am reading “Barefoot Church” right now. While I can think of 7 super-healthy foods that everyone should be eating, I’m not sure how beneficial limiting one’s diet to *only* 7 items can be. I just looked up the price because I’m considering buying it. It’s funny that it costs $7! ha! good one. it didn’t click w/me until u pointed it out. lovin’ the book, hope u do to. I am reading Facing Every Mom’s Fears: A Survival Guide to Balancing Fear With Courage, by Allie Pleiter. It has been really good so far. I would say it is especially a must read for newer moms! I’m reading Good News about Injustice. A tough and powerful read. Crystal I had to write you tonight before I went to bed to tell you I had to go this evening and find this book. It took me two book stores to find it but I got it. So excited to read it. Seven is my number… I have 7 kids so it just is my number. Plus you got me hocked on Carol Kent books, I’ve read them all now, so I know I will love this new author. I’m sure I’ll read all the books she has written now. You always are good about sharing good things to read, and I love to read. Going to see my mom next week and I’m flying and I don’t really like to fly so I’m hope this will keep my mined busy why I’m flying! Thank you. I saw 7 in a link here at some point and read about it and was intrigued, so I looked it up on my library’s website…and was able to put the very first copy they received on hold! I whipped through it…so, so good. I’m sure the library will be pawing for it back, but I want my husband to read it, so I just might have to buy a copy. I’m reading this book right now and I love it. I also want to read Interrupted and others by her because I loved it so much and it has confronted my consumerism. I have posted a book review on my blog as well. A while back I read a book called No Longer a Slumdog by K. P. Yahannan about Dalit children living in India, and their being given a hand up to a better life. Great reading!